The Mara River - A place where wildlife meets conflict: in its millions. The migration is a constant dynamic. But at one point during the cycle, a major obstacle stands in the way of the momentum. At first it causes a stutter and a pause, but then comes the surge and millions of animals cross the Mara River in one of the most spectacular wildlife scenes on earth. C4 has reserved a small, intimate and private camp in the heart of the action in perhaps the best time of year to see this phenomenon. In addition to a photo safari, there is a strong conservation initiative by C4 Photo Safaris on this safari. The greater Maasai Mara region is Kenya’s most important wildlife area and home to approximately 3,000 elephant. 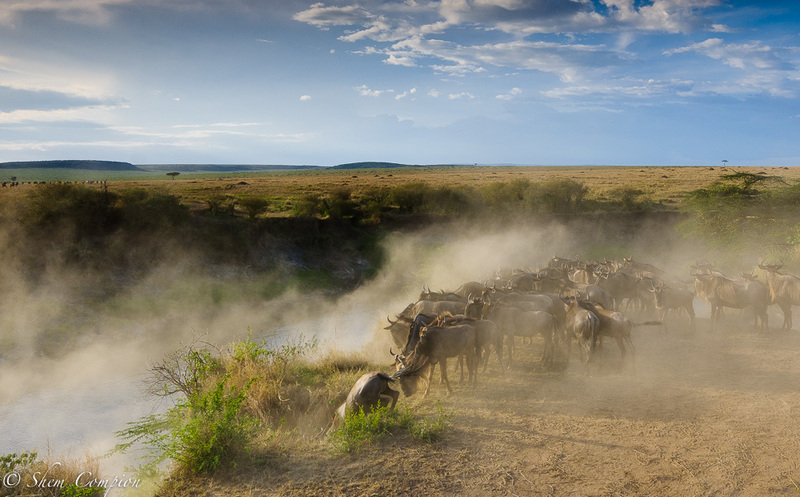 The Mara-Serengeti has one of the largest and most diverse large mammal migrations on earth. Poaching and rising levels of human-elephant conflict threaten elephants in the Maasai Mara, as human development continues to expand into traditional elephant rangelands, resulting in diminishing space for elephants and other wildlife and hence, very significant declines in their populations. In response to these threats Mara Elephant Project (MEP) has developed an effective number of interdependent programs such as anti-poaching patrols and rapid response ranger units, collaring, monitoring and collecting data on elephants, and using innovative techniques and technologies to mitigate human-elephant conflict. In conjunction with C4, MEP is now offering a conservation tourism experience. With our strong alignment with conservation, C4 Photo Safaris has partnered with MEP to take you into the heart of their conservation work, where you can experience and see the work and dedication that goes into protecting the greater Mara Ecosystems elephants. $1000 per person signing up on this safari will go to funding one collar and the full support of that collar, including collaring and replacement, for 5 years. C4 will have the opportunity to name one elephant- of which you will be able to track online to see how MEP’s contributes to its survival. We will spend one full day with MEP, starting with an early morning presentation at their Headquarters. You will meet MEP rangers, learn about their collar tracking system and unmanned aerial vehicle operation and get a tour of MEP. C4 Photo Safaris has timed this safari to link up with an elephant collaring. This will be a first hand experience of a very exciting operation, which includes finding the elephant, darting it from a helicopter and then replacing an old collar or attaching a new collar. It will present an exclusive opportunity for our small group to witness this operation. C4 Photo Safaris will be allowed to name one elephant. This is a once in a lifetime experience. Elephant collarings are usually reserved for on the ground operations teams. C4 Photo Safaris has negotiated that thanks to the contributions coming from this safari, you will get an insiders view to a collaring. Please note. While we time the safari over the actual collaring period of an elephant, there are a number of factors that can result in a collaring not taking place. C4 Photo Safaris takes no responsibility for us not being able to witness a collaring of an elephant. We all know that the Mara is home to the ‘greatest show on earth’. So C4 decided to run the best photo safari we could muster in the heart of the greatest show. Its simple really - find a camp in the middle of the action, book it for 8 photographers with the best photo camp operator in the business and then have C4’s professional photographers personally guide you whilst on safari. Between the C4 guides there are more than 60 seasons in the Mara and they have mapped their own special places and secret spots, which they will share with you while driving around. The Mara is a very large system and much of the conventional tourist traffic concentrates on a small section of the river. There is so much to see and photograph and with the knowledgeable C4 professional wildlife photographers as your guides, you will always have the best positions available. You will be taken to the far-flung corners of the Masai Mara, you will not only get to experience the migration, but also the beauty, freedom and wilderness of one of Africa’s greatest ecosystems. On this safari, there will be 3 vehicles with a maximum of 3 clients per long wheeled based vehicle, ensuring that everyone has ample room to photograph from. You will have ample space in a vehicle and guided by one of the two C4 Photo Safaris guides on the safari. In the interest of your photographic excellence, we have negotiated a camp right in the heart of the action, in the middle of the Mara. This camp has a major Wildebeest crossing right in front of it, so you may be lucky to have a crossing while enjoying lunch one day! Our driver guides have been working with C4 Photo Safaris for over 10 years now. They have an excellent knowledge of working with C4 Photo groups and can anticipate positions excellently. We will have 3 x Land Cruisers for our use. There will be 2-3 photographers per vehicle. The camp is a permanent tent camp- tents have flush toilets and hot water showers. The entire weight limit for the internal flight is 15kg. SafariLink strictly enforces this. Arrive in Kenya’s capital of Nairobi in the early afternoon. A 45-minute road transfer will take you to the African elegance of the Serena hotel. You will spend the evening in the lush and open surrounds of the Serena Hotel. One of Nairobi’s original hotels, this hotel has all the comforts of the past with the convenience of the modern era: The perfect place to relax for the evening. Our C4 photo safari guide will make contact with you at the hotel to arrange dinner for the photography group and discuss the logistics of the following morning. We depart for the Masai Mara at 10am on a scheduled flight and we touchdown at Ol-Kiombo Airstrip after a short 1-hour flight. From there we are transferred by road to our base camp situated in the actual Mara itself. You will be staying in a classic East African style safari camp consisting of canvas tents, staffed by local Maasai. You will have en-suite bathrooms with flush loos, flowing water and hot showers. While traditional, the camp is comfortable with large beds and private verandah’s. That afternoon we will enter the reserve for the first time and sample one of Africa’s greatest ecosystems. For these five full days, we will focus on showing you the best of the Masai Mara and this will include tracking the predators and getting to the heart of the action. You will be taken out each morning at first light. We will have Toyota Land Cruiser vehicles with roof top hatches and large windows from which to photograph. Brackets, braces and clamps can be fixed onto the rails on the vehicles for tripod heads and flash brackets. Everything is designed to aid your photographic enjoyment. One full day will be spent with MEP, starting with an early morning presentation at their Headquarters. You will meet MEP rangers, learn about their collar tracking system and unmanned aerial vehicle operation and get a tour of MEP. C4 Photo Safaris has timed this safari to link up with an elephant collaring. This will be a first hand experience of a very exciting operation, which includes finding the elephant, darting it from a helicopter and then replacing an old collar or attaching a new collar. It will present an exclusive opportunity for our small group to witness this operation. C4 Photo Safaris will be allowed to name one elephant. 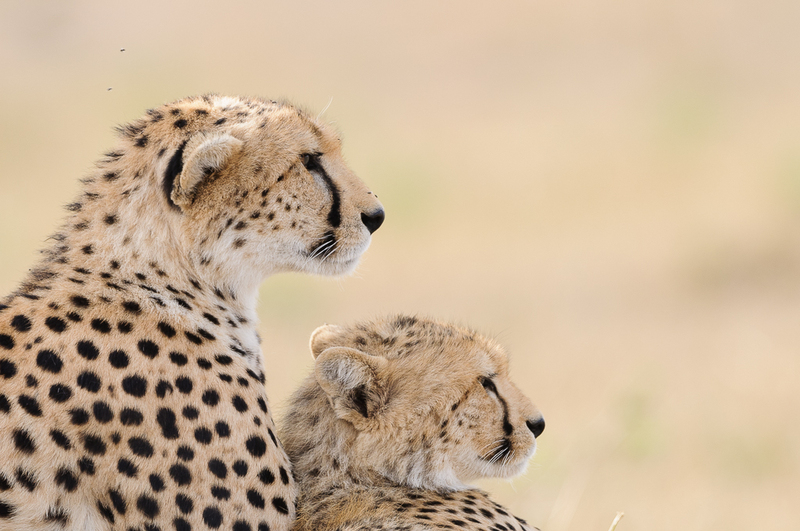 Besides tracking and following the migration, we will search for as many predators as possible,including cheetah, as the great plains are home to these majestic cats. You will also enjoy unfamiliar sights of general game such as Topi standing aloft termite mounds and tiny shy dik dik’s going about their daily routine. The Mara also houses some of the largest buffalo bulls on the continent and a huge density of raptors. A special for birders, amongst others, is the large and relatively common Rupell’s griffon. The evenings will be spent sitting around the campfire and dining on excellent camp cuisine. As the coals die down, the warm camp beds beckon and everyone retires to bed. The aim of this photo safari is to help you take amazing photographs and improve your own photography, no matter what level of photographer you are. The C4 photo guides will help you and during the safari will also present a series of photo critiques, lightroom and other slide show sessions in the evenings. These are always immensely popular and helps our clients gain some insight into the skill levels and experience of our guides- who easily impart their knowledge to you. Maximum of 9 clients, there will be 3 vehicles with 3 clients per vehicle. There will two C4 Guides that will rotate between the three vehicles. Exclusive use of three vehicles. A full day excursion to MEP Headquarters and photographing Elephant collaring.